Established in 1637, the Society is the premier change ringing society in the City of London, with a national and international membership that promotes excellence in ringing around the world. Practices are held at 6:30pm except at St Sepulchre (6:10pm). The next business meeting will be held on 14th May at The Counting House, Cornhill. The 2018 Anniversary Dinner was held on Saturday 3rd November. A report and photographs will follow in due course. The 2018 Country meeting was held in Cardiff. A report and photographs is available here. On 6th January a series of peals composed by Graham John was organised. More details are available here. The 2017 newsletter includes an excerpt from an article on meeting places used by the Society from the late 18th century to the present day, written by our former Librarian, Chris Ridley. 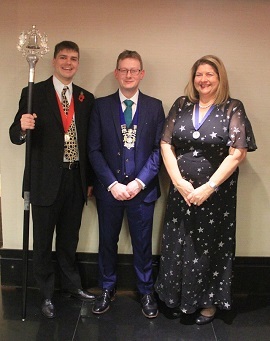 At the November meeting Leigh Simpson was elected as Master. Henry Coggill becomes Immediate Past Master, a position vacated by Rob Lee. Swaz Apter was elected Senior Steward, and Ryan Noble joined the top table after his election as Junior Steward. A peal weekend will take place around Sheffield over the weekend of 4th-6th May. Please contact The Master for further information. The 2019 Country Meeting will take place in Bristol. Further information is available here. at Willingham (Cornhill vestry north), Cambridgeshire. at East Grinstead (St Swithun), West Sussex. at South Croydon (St Peter), Greater London. at City of London (St Magnus the Martyr, London Bridge). at Dordrecht ('t Klockhuys), Netherlands.